I really enjoyed this book. The British flavor is a delightful change and the heroine is far from perfect. She's like me -- struggling to live her faith in the midst of an often confusing situation. 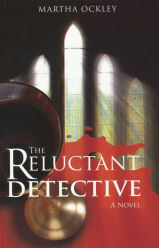 She's also a not-quite-reformed former detective, who can't help investigating when a fellow clergy member is murdered. I can't wait to find more books by this new-to-me author. The Reluctant Detective sees Faith Morgan arriving back in the region of her birth - Winchester in Hampshire. Recently ordained, she had been working as a curate in an Anglican inner-city church. Within an hour of her arrival at Little Worthy, she witnesses the sudden shocking death of a fellow priest during a communion service at St James's. He had been poisoned with a pesticide mixed with the communion wine. The senior police officer who arrives at the scene turns out to be Detective Inspector Ben Shorter, Faith's ex long-term boyfriend. She is urged by the Bishop to stay on to look after the parish of Little Worthy. As she meets her parishioners she learns some surprising facts about her apparently well loved predecessor, and starts to suspect a motive for his death. And it is she who finally identifies the murderer. The story gets off to a dramatic start with the previous vicar collapsing as soon as he drank the communion cup, and it holds the interest throughout. There is some romantic interest too. Inspector Ben Shorter starts by sneeringly telling his sergeant, "Ms Morgan is a vicar. One of the ordained," Ben emphasized the word. “She's a card-carrying professional at the touchy-feely stuff.” But he soon starts to feel differently about her again, although she is well aware that he "didn't understand the reality she experienced through her faith. He didn't even recognize its existence. That was the gulf between them." Her own beliefs and doubts are convincingly described, for even she can't help wondering, "What if there is no truth to it?" But for her, as for Pascal before her, it was a gamble worth taking.